When communicating online, words sometimes just aren't enough, says City University London Professor Adrian David Cheok. 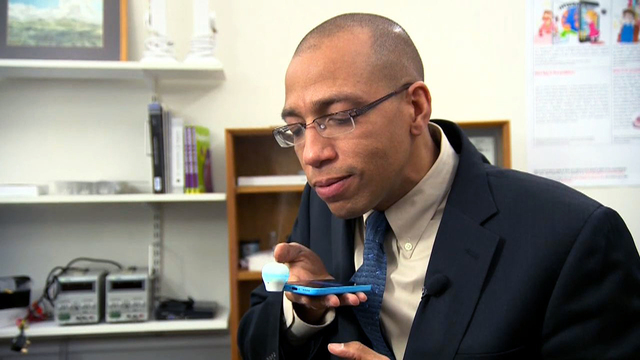 Now, he has a solution: researchers at his Mixed Reality Lab on campus are coming up with ways to say it with a smell -- developing cell phone apps and plug-ins that emit scents like flowers, food and spices. "Smell is a very powerful, powerful sense. It can trigger an emotion or memory at a subconscious level -- before we logically think about it," Cheok tells CBS News. The lab has already created technology able to send the smell of flowers to a loved one via text -- provided the recipient has a special digital device plugged into the earphone jack of their smartphone. The first application of this technology was the Hana Yakiniku plug-in released in Japan last year. It became available internationally on Amazon in February. The video marketing the Hana Yakiniku attachment presents hilarious digital smell solutions to common problems: the poor college student, for example, who can now dine with his iPhone and sniff beef-scented cartridges of the meat he can't afford, while eating plain rice for lunch. The plug in sells for about $35. Refill cartridges come in scents like lavender, coffee, and rosemary -- oddly, though, there are no refills for the scent of meat, as advertised in the video. The refills cost about $5. The technology can be used in a range of commercial applications, from diet programs, advertising and health care, to cooking recipes and personal communications. "You can send someone a Facebook message, but instead of just putting you are 'feeling happy,' you'll also have the floral smell," Cheok says. "For our everyday communication, we want to be able to have a much wider range of experiences being transmitted. Not just sending data, not just sending information -- we want to share our experiences," he adds. Kraft Food's Oscar Mayer brand is embracing new smell technology. Its Wake Up & Smell The Bacon internet campaign and giveaway of bacon-scented iPhone plug-ins is going viral. The dream-scape concept video features a woman waking up to the smell of bacon wafting from the device, which can be set to go off with an iPhone's alarm clock. The official YouTube video racked up more than a half-a-million hits in less than a month. "People never get tired of bacon," says Tom Bick, Sr. Director of Integrated Marketing and Advertising for Oscar Mayer. "[We're] thrilled...to give bacon aficionados a new reason to welcome their morning alarm clocks." Oscar Mayer says they've received more than 148,000 applications online to receive one of "a few thousand" free plug-in bacon-scent cartridges, which are good for about 100 uses. When CBS News informally surveyed Londoners, showing them the floral-scented plug-in device attached to an iPhone, reviews were mixed. "First I thought it was a microphone, because it kind of looks like one. But yeah, it does smell a bit like air freshener," said Dario Medina, a student from Spain. But Londoners Gaya Pathma and Allen Koshy seem more impressed by the technology involved than by the smell. "Just because it is new and different right now, it might be just weird at the moment," says Koshy. "But once it becomes a trend or something, it will be just fine." "It is a scent coming out of a phone. It was a bit scary, but really nice," Pathma says. Margaret Brennan sat down for an interview with Democratic presidential candidate Sen. Cory Booker, D-New Jersey, on April 13, 2019.